Paige suggested we start the engagement session in their home, with their dogs, surrounded by the things they love and all the plants they try to keep alive. (lol, love you Paige!) The energy with these two is so deep, kind, open-minded and empathic and their love for one another is the same. We can not wait for the wedding in June, at Greenhouse Two Rivers! This engagement session was so so fun, we brought over some beers to share and snuggled their dogs while they finished getting ready. 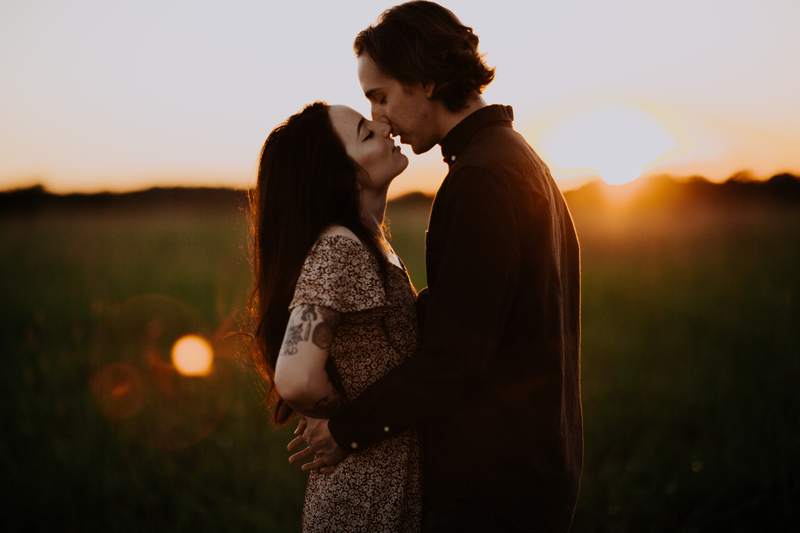 But what is an engagement session with Elise Abigail Photo without some sunset photos?! So we loaded into the fiat and made our way to the prettiest overlook spot in Ozark, just outside of Springfield, MO. We walked, talked and listened to music while capturing their love. After the most brilliant pink hazy sunset engagement photos, we dropped them off at their house and stood in their driveway for another 30mins just talking. Seriously, can’t get enough of these two. For another great sunset engagement session, check out: Chelsey and Nick’s Downtown Engagement!